Exactly what vegan activists did in Australia yesterday. Hiding in abattoirs and demanding animals be surrendered: What vegan activists did yesterday. 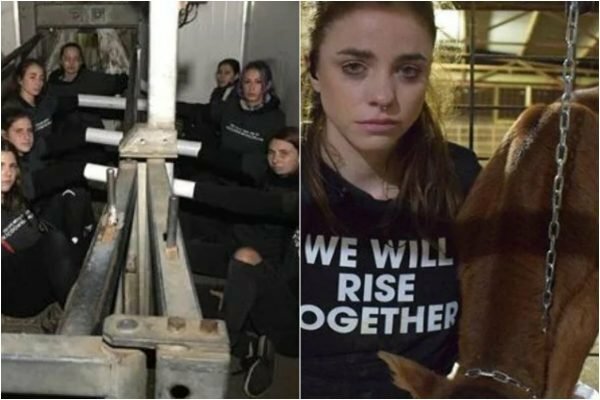 In a highly orchestrated series of sit-ins, blockades and abattoir invasions, vegan activists yesterday staged a series of protests around Australia against animal cruelty. They timed it to coincide with the one year anniversary of the release of anti-animal cruelty documentary Dominion. It’s being touted as the biggest animal rights protest the world has ever seen. Here’s the trailer to the documentary. Post continues after video. 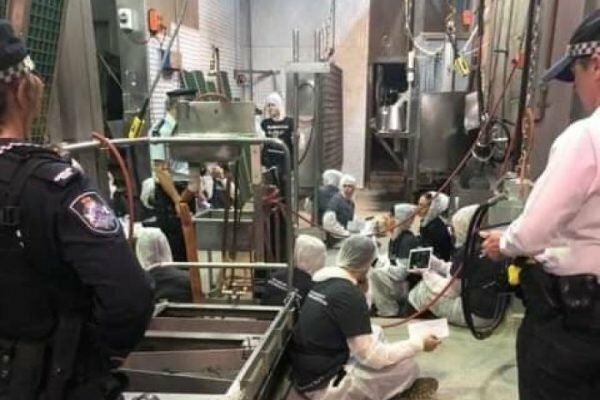 Nine protesters were discovered inside the Southern Meats abattoir in Goulburn, chained to machinery, around 2.30am in the morning. Police arrived 90 minutes later and cut the protesters from their restraints. They had to carry three of the women out, after they refused to walk. More than 20 people invaded the Carey Bros Abattoir near Warwick in southeast Queensland at 3.30am. 200 more protested outside. The protesters claimed they wouldn’t leave until the animals were surrendered to them. The abattoir was eventually forced to hand over three lambs to disperse the group. 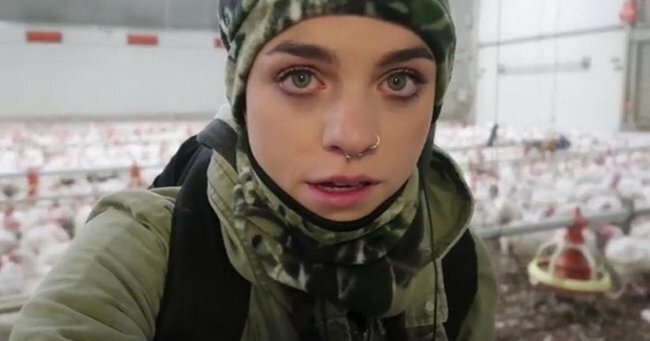 Self proclaimed “vegan soldier” Alix Livingstone, 23, gave us an insight into the trespass and protest she led at an abattoir in Laverton in western Melbourne in an hour long video uploaded to Facebook. Her troupe chained themselves to the pig pens while she roamed around filming. They were eventually arrested by police. “They refused to let us save a life today which means that when we leave every single one of these pigs will be lowered into a gas chamber,” she tells the camera. Livingstone proudly wears a "We will rise together" tattoo on her arm, the motto from Dominion. Her Instagram shows her yelling at farmers at a lamb sale "50 million lambs, we are here to stand up for the victims." 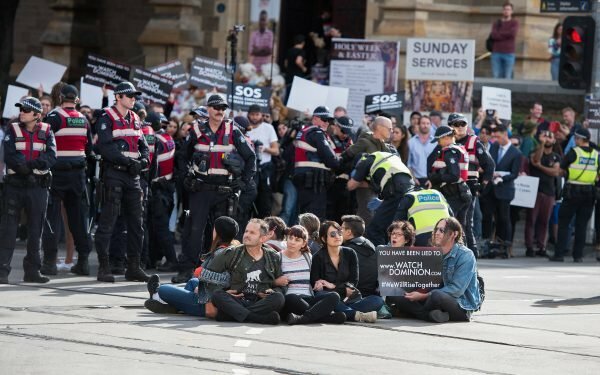 Meanwhile in Melbourne&apos;s CBD, a group of about 150 blocked off a popular intersection - one of the busiest in the country actually - causing traffic mayhem. They chained themselves to vehicles and held signs reading "Watch Dominion." It affected 11 trams, and forced ambulances to take different routes to five different hospitals. In total, 39 people were arrested, including a 15-year-old. Victorian police also noted a number of other protests by vegan activists taking place in other locations including Bacchus Marsh, Laverton North, Pakenham and Corio. In Sydney, a dozen people dressed in black and marched through the city. The event organiser told the Today Show they had nine teams around the country orchestrating protests. “We want to show we’re regular people who have had enough, we are killing the planet and killing animals at rates that are just unacceptable,” Kristen Leigh told the show. Protesters in Queensland. Image: Green Shirts Movement. On Sunday, we saw the ramifications of protests such as this. A country cafe was forced to close its doors after receiving four months of threats from activists. "This was not an easy decision to reach, however we feel for the sake of our health and safety and that of our families and staff we feel that it is regrettably the best option," The Gippy Goat Cafe posted on Facebook. Aussie farmers have taken to social media to vent their fury at yesterday&apos;s demonstrations. “So wrong it’s come to this, us farmers having to be vigilant while we are out in the paddocks feeding our stock,” wrote one farmer from Western Australia. The Prime Minister condemned the behaviour as "un-Australian." "If there are pastoralists and farmers that are in a position to actually bring a civil action against these groups... then the [Australian government] is totally open to supporting them in a test case," he said. Dr Tyler Paytas, an expert on vegan thinking and activism told The Age the protest could prompt people who "ordinarily wouldn&apos;t pay much attention to the ethics of animals to stop and think." He also acknowledged that it could "exacerbate people thinking veganism is a weird movement and is a fringe thing that shouldn&apos;t be taken seriously." He suggested activists think carefully about whether their actions will benefit their cause.